Drip irrigation systems conserve water by delivering a measured amount of water through emitters like these. Irrigation is a key component to any landscape. 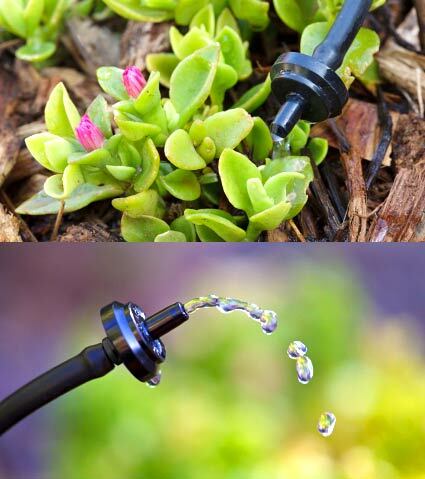 The RainCatcher offers efficient watering techniques that can help to save money and water, and help a landscape thrive within the first few weeks of installation. Irrigation systems can be fed from municipal water sources, wells – and even better – water catchment systems! Using rainwater as a primary irrigation source is a wonderful way to grow a healthy landscape (rainwater is balanced in pH, has beneficial microorganisms, is low in Total Dissolved Solids/TDS and salts, and is charged from electrical storms) and helps with overall water conservation. 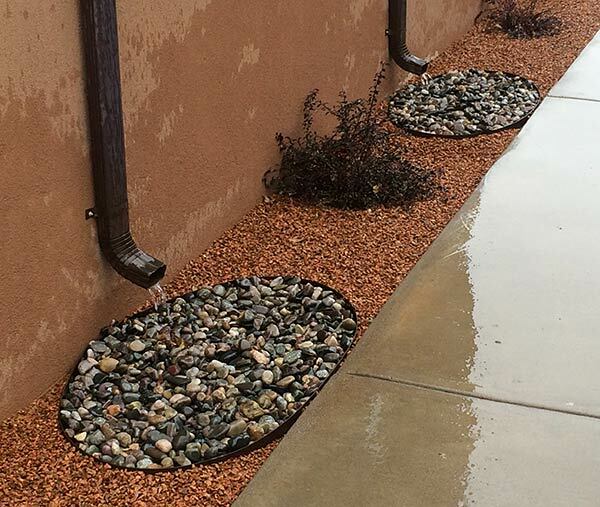 Rainwater is directed through downspouts from roof canales and into catch basins that can feed into pumice wicks or storage cisterns. What are some common ways to redirect rainwater into gardens? Lots of water comes off our canales and downspouts. Simply re-routing the water to a tree with a berm around it will capture hundreds of gallons of water that may be unused otherwise. Water can also be channeled from the roof and into pumice wicks to irrigate an area of your property. A pumice wick system allows water to be captured from a roof and be gravity fed out to an area to irrigate landscaping or trees. A pumice wick is a trench that is lined with geotextile fabric, filled with pumice, and has a perforated pipe running level throughout the trench. 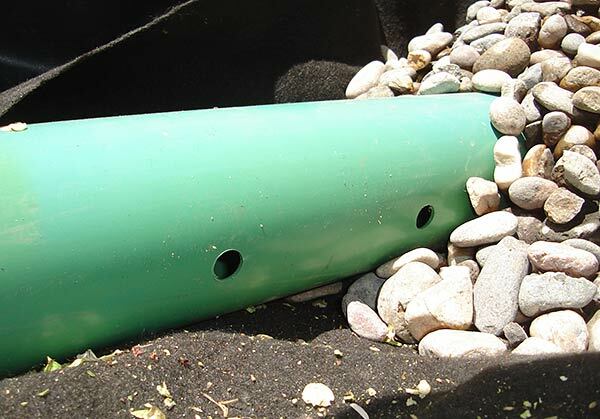 This level pipe allows water (rainwater or greywater) to move through the entire area of the trench equally. The pumice provides air space and keeps the area full of oxygen. The water can then be “wicked” out of the structure by the plant roots. A perforated pumice wick pipe allows water to be gravity-fed and delivered where needed. Does The RainCatcher work with irrigation systems that do not rely on rainwater catchment? Raincatcher can audit an existing drip irrigation system so that it performs more accurately and effectively, and uses less water. Some drip irrigation systems use rainwater as a primary water source and others do not. The RainCatcher can help with design, installation and maintenance with either type of system. 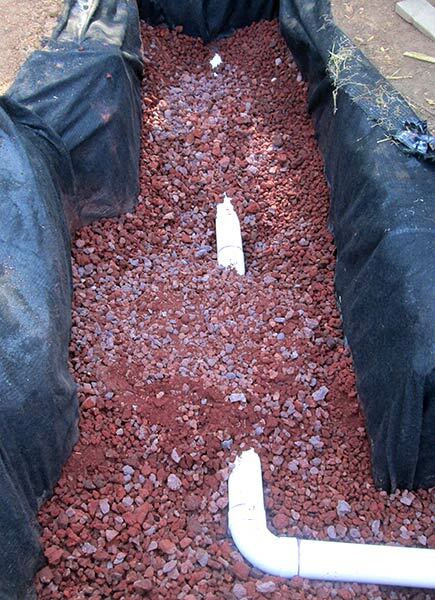 A pumice wick system passively and efficiently delivers water to landscaping or trees. What are some common irrigation systems and how do they work? Installation of drip irrigation systems depends on the size of the property and the complexity needed to water the site appropriately. Usually irrigation systems will be comprised of a pressurized water source (city, well, raincatchment) that is moved through a manifold that separates the different zones needed. Trees have different water needs than the garden for example. How long does installation take and what is the cost range for it? Prices on systems are all completely different, and depend on the size and scale. Call us for a free estimate! Systems usually take from a few days to two weeks to install. 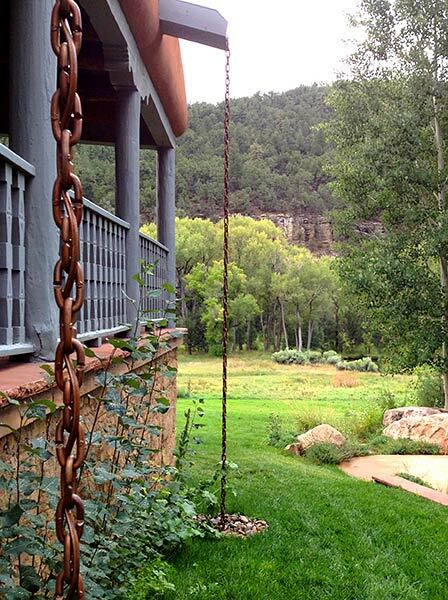 Rain chains guide water from the rooftop canales into the barely visible catch basins below. Will it disrupt my lawn/garden and make it look messy? A properly designed irrigation system should be aesthetically pleasing and not make things more complicated in the garden! Depending on what is being watered (garden, trees, lawn) different techniques are used. The RainCatcher utilizes underground networks of pipes, sprinklers that pop up only during watering, hidden pumphouses and other strategies to keep the system barely visible and unobtrusive. What about winterization/maintenance for the irrigation systems? Maintenance for drip irrigation systems are important and are completed twice per year. Once in the spring for a “turn on” and once during the winter for a “turn off.” Usually the spring turn on is a little more complicated because each aspect of the system needs to be run and tested before it is turned on. This ensures that there are no leaks or problems for the watering season. Why should I use The RainCatcher to install an irrigation system on my property? The RainCatcher has been working with water and irrigation for over 15 years and has a highly knowledgeable crew and staff. We are also licensed with the state for all irrigation/water catchment needs. See our testimonials to read what other customers have said about our work!